Near the Kremlin in central Moscow more than 420 people were arrested, protesting against the sentences handed down to eight defendants in the ‘Bolotnaya’ case. Journalists were among those detained. 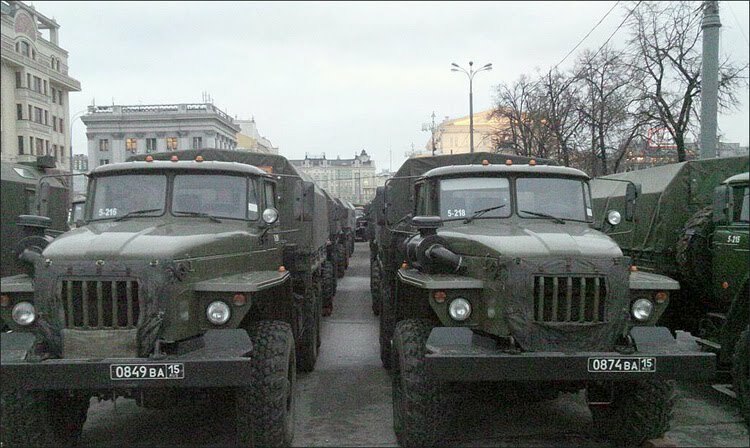 In the Kremlin area the numbers of police and internal affairs forces were increased. According to the BBC, at the time of this reporting entrance to Manezh Square is closed. For the third time in one day, Ilya Yashin was again detained: in the morning he had also been twice taken away to a police van near Moscow’s Zamoskvoretsky court. British journalists reported that several protestors had sought to bring tyres with them – before the protest there had been calls to burn tyres as had been done on Kiev’s Maidan. People carrying Russian flags were also detained. Opposition leader Sergei Udaltsov wrote on Twitter : "The number of those detained on Manezh Square is increasing all the time, people are being seized by the police without any legal basis ". From the side of the Square near Tverskaya Street several hundreds of protestors had gathered, and several hundred more were on Revolution Square, on the other side of the Manezh. Earlier in the day people were arrested outside the building of Zamoskvoretsky courthouse after the sentences had been delivered.